You may find you get pop-up messages in some WebbIE applications and more generally in Internet Explorer that tell you about scripting errors on the web page. Generally, unless you are a web developer, you just don't care about these messages and don't want them to appear. 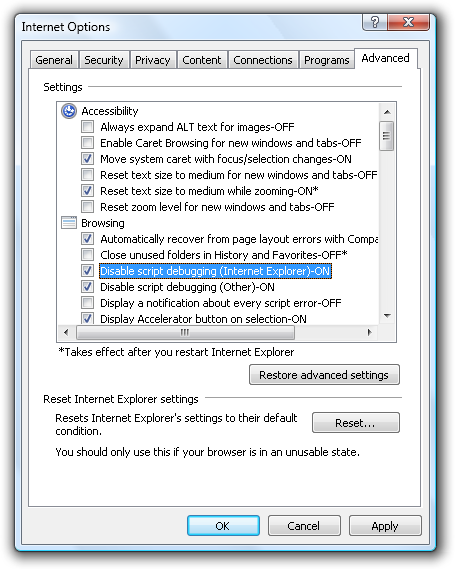 Turning them off won't hurt the operation of any program, so here is how to turn off scripting error messages in Internet Explorer. These messages say things like "Errors on this webpage might cause it to work incorrectly." You should now be in a list, starting with Accessibility as the first item in Internet Explorer 8. This has the scripting options you want to change. Cursor down to "Disable script debugging (Internet Explorer)" and press Space until it is on. Cursor down to "Disable script debugging (Other)" and press Space until it is on. Press the Return key to close the Internet Options dialog. You should now have turned off the scripting errors. Update Internet Explorer. You should be on the latest Internet Explorer, it's safer and better. You can get it from Windows Update. Start Internet Explorer, Alt and T for the Tools menu, then cursor down to Windows Update. Change your antivirus program. These cause no end of trouble. Set your Internet Explorer Security settings to Default. You do this again in the Internet Explorer Tools menu, Internet Options, Security tab, and click Default Level. Delete your Internet Explorer temporary files and cookies and history. Internet Options, General tab. This will mean you'll have to re-enter your username and password in places where you've saved it, so make sure you know them all before you try this. Still no good? There are two a Microsoft Support Knowledgebase Articles, How to troubleshoot script errors in Internet Explorer on Windows-based computers from which I've taken some of the above, and Fix runtime errors in Internet Explorer, which have more suggestions and approaches.